There are many types of psychic abilities. 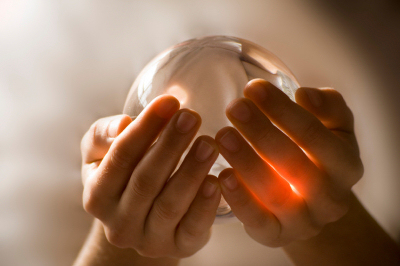 Clairvoyant psychics have visions that allow them to see into the future with their mind’s eye. The word clairvoyant means to see clearly. By intuitively connecting to energy, a clairvoyant can see things other people are unable to see. Many clairvoyant psychics specialize in a particular area. One of the most popular specialties is relationships. A relationship clairvoyant provides peace of mind by helping people identify solutions to interpersonal issues. Some clairvoyants see things that happen in the present but very far away. For example, sometimes law enforcement will hire a clairvoyant to find a missing person. However, many clairvoyants are able to see into the spirit realm as well. Messages often appear as symbols which the clairvoyant must then interpret. Tarot cards: A clairvoyant arranges Tarot cards in a spread, with each position representing a different aspect of a question. For example, the Three Fates are three cards that represent the past, present and future. Card is either Minor Arcana, resembling a deck of playing cards, or Major Arcana, stand-alone cards such as Strength, Death, Temperance and the Fool. Clairvoyant psychics use Tarot cards to type into universal consciousness. The ultimate love Tarot card is the Lovers. Runes: Psychics use runes for spiritual insight. They are a set of 24 tiles or stones containing characters and letter carvings, each with its own symbol or meaning. Wunjo is the Rune of total love, while Tiewaz indicates romantic love. Just like the Tarot, clairvoyant psychics arrange Runes in a spread before doing a reading. There are many types of spreads. Some of the most popular spread are the Diamond, the Cross and the Single Rune. Crystal balls: By using a crystal ball, a clairvoyant can receive visual images of past and present events. The process of looking into the crystal ball is ‘skyring.’ It is essential that the clairvoyant establish a link with the sitter via the crystal ball in order to receive subconscious images. In early psychic history, crystal balls were actually made of solid rock crystal. However, because crystal is so expensive, many clairvoyants use crystal balls made of glass. What do they see in relationships? Love is complex and can be frustrating to navigate. One that many people struggle with is defining their relationship. By connecting with your energies psychically, a clairvoyant can help you identify solutions to your relationship problems. Not all relationships are romantic. Family relationships can be just as stressful. Fortunately, a clairvoyant can provide insight into your family connections and provide a unique perspective. After making an appointment with a clairvoyant, spend some time thinking about your relationship questions. It is often helpful to meditate before a reading so that you can get in touch with your own energies. This entry was posted in Cards and Divination, Love & Relationships, Prediction, Psychics, Singles, Soul mates, Sprituality, Tarot on September 1, 2014 by Mirella.